colorful culture and an atmosphere to match. See the Rynek, Wrocław Town Hall and Ostrów Tumski to see what we mean. Wroclaw is a charming and buzzing city (Poland's fourth largest) in the southwest corner of the county. Filled with centers of higher education the city has a young, vibrant atmosphere that draws young people from all around Poland. The city center is filled with colorfully striking architecture and innumerable bars and restaurants making it a destination for nightlife seekers and foodies alike. Wroclaw is a pleasant city with amazing architecture. It's still not very much exposed to foreign tourists, compare to Warsaw or Krakow. Of course, Wrocław's dwarfs is one of the main attractions. Pleasant city with nice architecture and an interesting history and an odd near-absence of tourists. Wroclaw will be a European City of Culture in 2016. So get here now. The gorgeous market square is the defining feature of Wroclaw. In Europe I generally avoid eating or drinking on the main square because its usually overpriced and not very good, but in Wroclaw I loved getting beers on the main square. The brew pub there is excellent and beers are served up with bread and lard. Wroclaw is a beautiful city to visit no matter the time of year. It has fantastic architecture and was an absolute joy to wander through. I particularly like all the gnomes that were stashed throughout the city. Stunning city, great campsite in town and superb tram network. Stunning fountains in the centre of town and add the friendly locals and you get the picture - perfect. Wrocław! What a place! 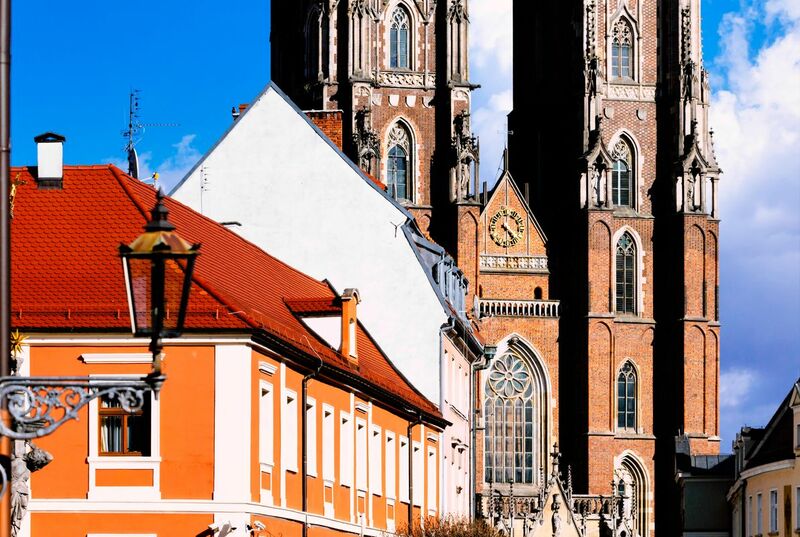 Its Gothic and baroque buildings, its vibrant student population, and its precious Old Town add up to make it a special place in the Polish heart. You too would enjoy watching the mighty Odra River wrap around Piasek Island. From there, you would cross another bridge to reach the idyllic Ostrów Tumski (Cathedral Island), which lives up to its name. Finally, recross the bridges, go to Plac Solny (Salt Square), where they sell flowers, and you’ll be on the threshold of Wrocław’s restored masterpiece: the immense Centennial Town Hall.